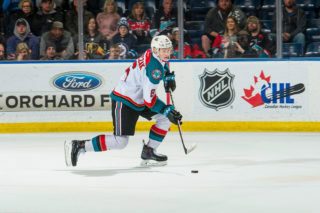 The Kelowna Rockets downed the Tri-City Americans 4-3 in a shootout Wednesday night at Prospera Place. Erik Gardiner(5) got things started for the Rockets 8:15 into the opening period when he was able to whack his own rebound past Americans starting goaltender, Talyn Boyko. Liam Kindree(6) would extend the lead to 2-0 at 14:07. Nolan Foote’s shot was initially blocked, but was there Kindree was there squeak the puck past Boyko. The Rockets headed into the first intermission with a 2-0 lead. The Rockets made it 3-0 just 1:54 into the second period. Liam Kindree was sitting behind the net when he found Nolan Foote(17) all alone in front. Kyle Topping was called for high sticking with 51 seconds left in the period. The Americans were able to capitalize on the power play when Parker AuCoin(14) scored on Rockets starter, James Porter. After 40 minutes of play, the Rockets held a 3-1 lead. Lassi Thomson was called for tripping after he delivered a hip check. The Americans were able to pull within one goal on the ensuing power play when AuCoin scored his second of the night at 8:53. Offsetting minors were called after some pushing and shoving just past the midway point in the period. With plenty of room to play the teams went back and forth, Aaron Hyman(6) tied the game with 2:36 left to play in the third. 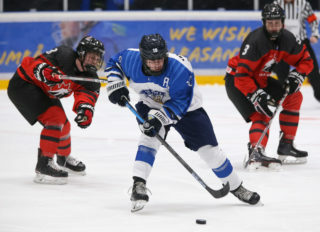 The game remained tied as the period ended, overtime would be needed. During overtime the teams exchanged chances. With 11 seconds remaining, Porter looked down and out but got his paddle out to stop a sure looking goal. A shootout would be needed to determine a winner. The Rockets elected to shoot first. Kindree and Nolan Yaremko both missed in the opening round. 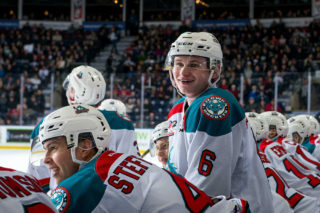 Foote was successful for the Rockets in the second round while Kyle Olsen missed. With the game on his stick, Leif Mattson was triumphant in securing the win for the Rockets. Kelowna’s record moves to 13-15-2-0. James Porter’s record is now 4-6-1-0, he stopped 28 of the 31 shots he faced. The Americans outshot the Rockets 31-27. 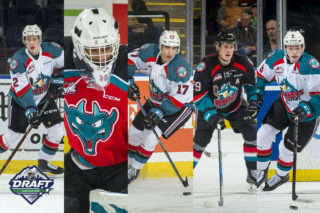 Kelowna will be back in action Friday, December 7th when they host the Victoria Royals at Prospera Place for the final home game before the Christmas break. 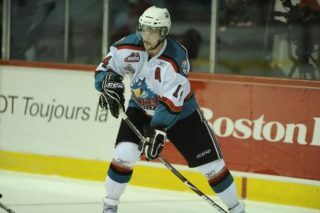 Tickets are on sale at selectyourtickets.com, at the Prospera Place box office or by phone at 250-762-5050.